Happy Halloween everyone! Being that today is All Hallow's Eve, I thought about what I should write while snacking on some inexpensive tooth decay. I have another book review ready to go, but that's going to wait until tomorrow. Instead, I am going to bring you another round of "You're Wearing That". The Scary Day Edition will introduce you to more jersey offenses made by professional hockey teams. The term "professional" is used loosely, though. In any case, like the other "You're Wearing That" articles, this one has some jerseys that may not be suitable for all readers. Viewer discretion is advised. Please note that you can find the four previous editions on the right under the category of "Highly-Clicked Articles". Here we go with the new addition to the family. 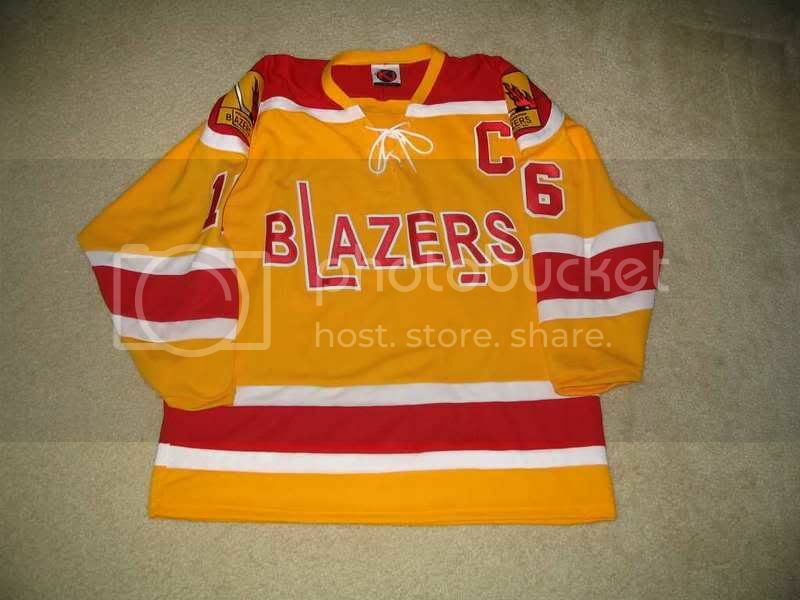 The WHA's Philadelphia/Vancouver Blazers have to get mention on here, mainly because of their name. Blazers makes me think of fire, and they certainly have the colours right. Honestly, though, could that logo be any more boring? Add a flame or two to a few letters, and it would be better than what is currently shown. These jerseys only lasted from 1972-74 - in 72-73 as a team in Philly, and in 73-74 as a team in Vancouver. 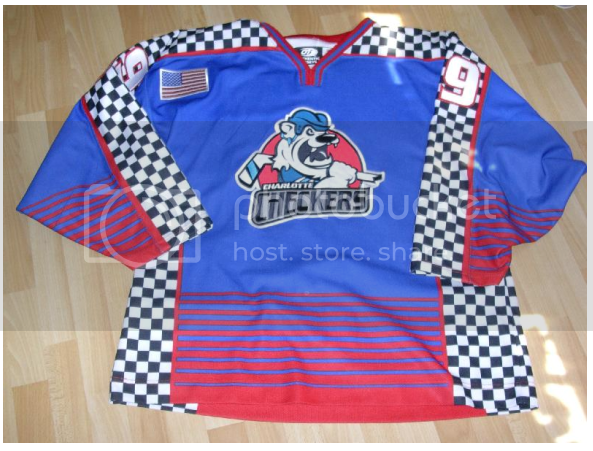 The ECHL's Charlotte Checkers decided that a jersey to commemorate Race Night would be a good idea. I have said it before, and I'll say it again: cross-promotion of sports is a terrible idea. These jerseys are horrible, making this one of the worst promotional jersey ideas ever, in my humble opinion, due to their hideous colours and the stupid promotion. The ECHL's Florida Everblades are celebrating their tenth anniversary this season with a jersey. How many times do I have to repeat myself on this one? Anniversaries are meant for patches, not for jerseys! The fact that they complete the jerseys with some Barney Rubble Hairpiece numbering on the shoulder only makes this jersey even worse. The WHL's Saskatoon Blades are going to be honouring the men and women of the Emergency Services with their own night and promotional jersey on November 10th this season. The jerseys are alright, and they are honouring real-life heroes, so these jerseys will not get a bad word from me. Like previous instances, good on the Blades for honouring the men and women who risk their lives to save others. The national Israeli ice hockey team is working towards becoming a hockey power in the IIHF world. Did you even know Israel had an ice hockey team, let alone being an IIHF member? Well, they do, and they played in the 2006 IIHF World Championship Division I Group A pool at Amiens, France from April 24 to April 30, 2006. I'll give the Israelis credit - they showed up and played hard, despite losing all five games while being outscored 47-3. I'm not saying that their home jersey or road jersey had anything to do with it, but they don't look like hockey players wearing those jerseys. At all. Whatsoever. 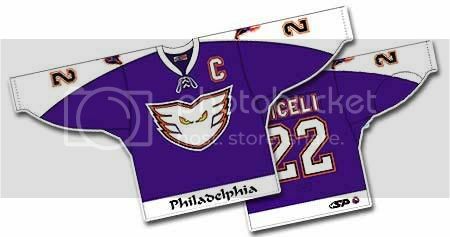 The AHL's Philadelphia Phantoms wore a purple jersey as an alternate jersey during the 03-04 season. If you ask me, they aren't that special. Yes, they are an alternate colour of the Phantoms, but they don't really come across as anything I'd be proud to wear. 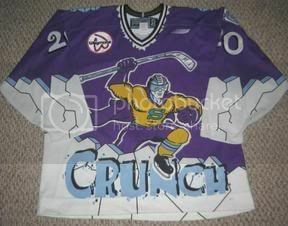 The AHL's Syracuse Crunch also wore an interesting alternate jersey in their history. These jerseys were worn during the 1999-00 season. Apparently, the Crunch players are some sort of superhero or something. However, their average win-loss record from that season of 35-35-9-1 seems to indicate differently. Oh, and they were outscored 294-290 on the season. The Crunch don't seem like they are of superpowers when you look at that season at all. Thankfully, those alternates are gone. The University of Nebraska at Omaha recently donned pink jerseys to help with Breast Cancer Awareness month in October. The UNO hockey team raised over $10000 auctioning off the pink jerseys in support of breast cancer research. Kudos to the UNO hockey program for doing something that can affect each and every one of us. I may not like the colours, but the promotion gets a thumbs-up from me. For more info, please read the full story at The Gateway, UNO's newspaper. 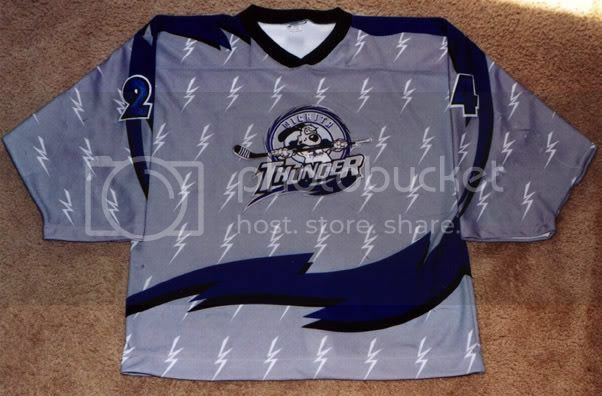 THe CHL's Wichita Thunder decided that they needed an alternate jersey. Unfortunately, what they got wasn't very pretty. Gray? Crappy little lightning bolts? A wave of colour that does absolutely nothing? Numbers that are hard to read? Yeah, you know I'm not a fan of these. 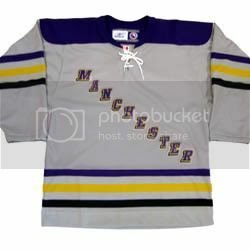 The AHL's Manchester Monarchs also thought they could use an alternate jersey. Why is it that it seems that teams need an alternate jersey, only to deliver the crappiest alternate jersey ever? These are horrible! Three-coloured stripes? A ripoff of the New York Rangers' diagonal lettering? No logos on the shoulders for identification that this is an actual professional team? What is going on here? 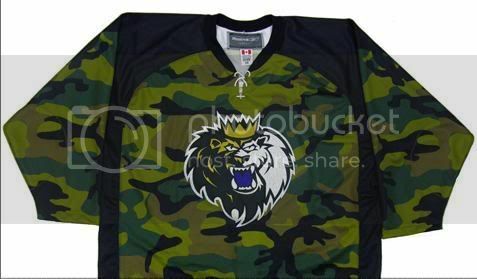 However, the Monarchs will honour the men and women of the military with their own night on November 17, 2007. This jersey is decent, and should be used a replacement for that horrible alternate piece of crap. 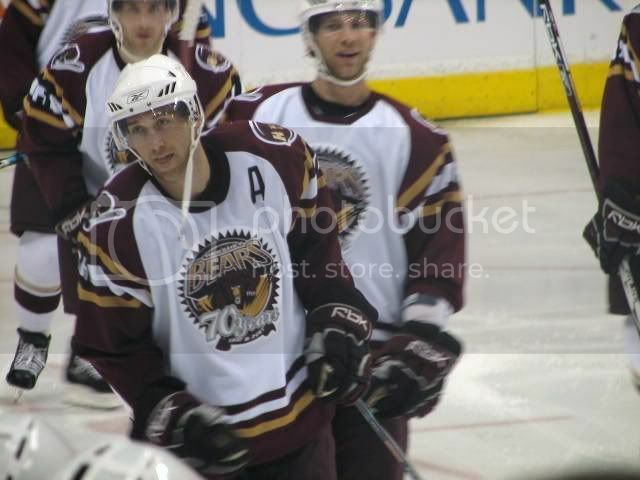 In keeping with the AHL, the Hershey Bears wore jerseys to commemorate 70 years of hockey in Hershey. I can't tell you how disappointed I am in Hershey for making their anniversary more important than their logo. Hershey, why would you make the most blatent of jersey offences? Especially when you are so steeped in hockey tradition? What bothers me even more is that the nameplate is allowed to spread over the coloured shoulders. That's brutal! Woe is me over these jerseys. The IHL's Cleveland Lumberjacks had some eyesores, but one very beautiful jersey in their short time. In 1998-99, they came out with two jerseys - one good, and one bad. The bad one was the Turn Back The Clock jersey which nearly blinded me when I first saw it. 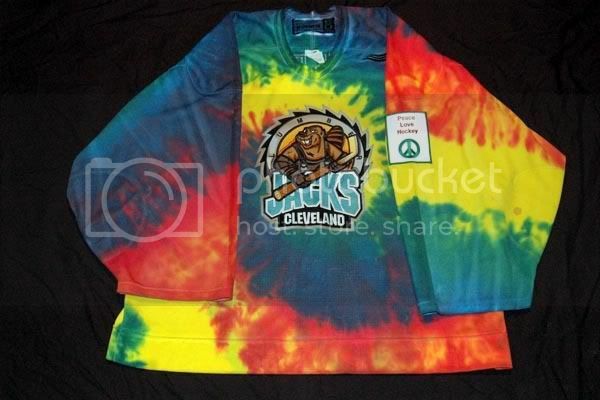 Tie-dyed jerseys are never good, especially when they turn out as badly as this one did. However, during that season, the Lumberjacks held a Heritage Night as well. 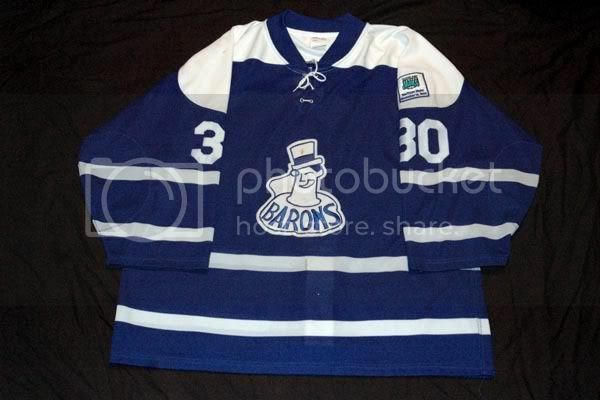 During that night, they sported these classy and elegant Cleveland Barons throwback jerseys. I am a fan of these jerseys, and even more of a fan of that logo. These are impressive. 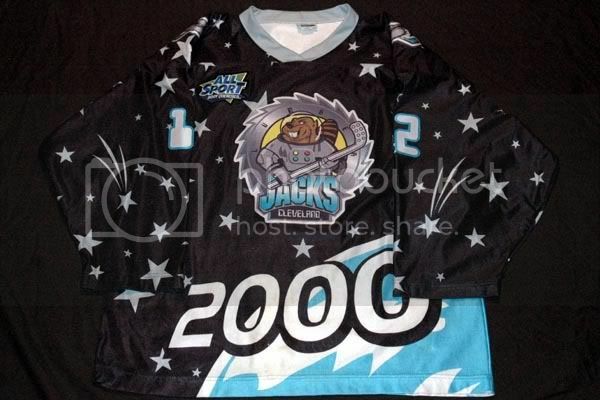 Unfortunately, the Lumberjacks went back to their cartoonish ways with their Millenium Night jerseys. They even tried to sci-fi the font on the back which only adds to their cartoonish appearance. I'm not sold on these jerseys, but I would take a Heritage Night jersey in a heartbeat. The NHL's Dallas Stars wore these alternate jerseys last season. For the longest time, they were simply known as the Dallas Fallopian Tubes in these jerseys. That's not very intimidating at all. And would explain why they didn't keep the alternate logo this season. 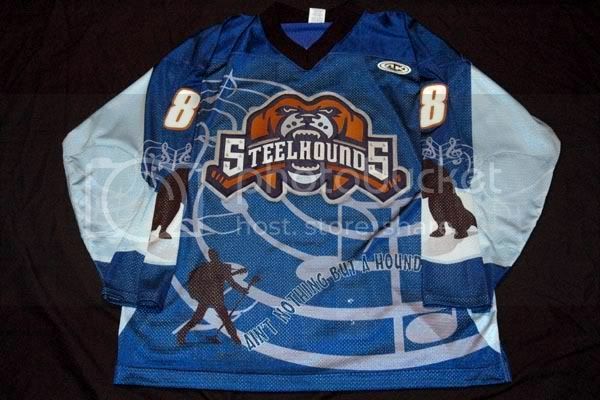 And lastly in this look at some questionable jerseys, we feature the CHL's Youngstown Steelhounds. 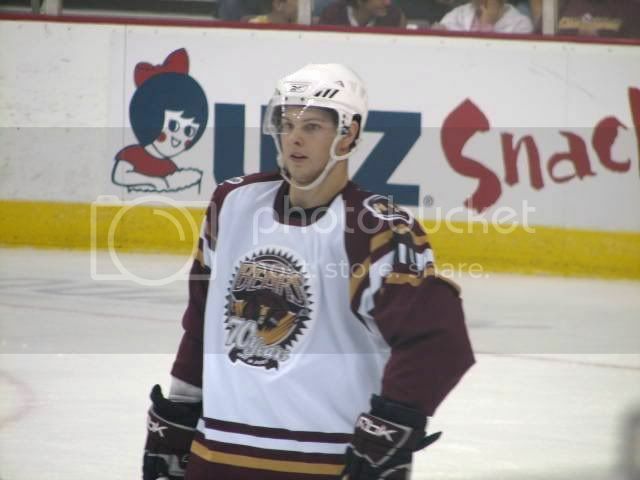 The Steelhounds held an Elvis-themed night in the 06-07 season, and wore jerseys for the event. 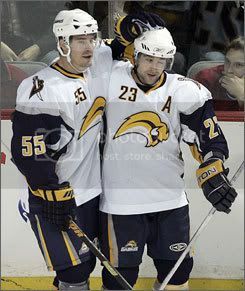 I am not particularily impressed with these jerseys, but they could have been so much worse. With that fact alone, I'll give these jerseys a passing grade. They aren't bad, but they certainly are not that great either. There's a little fun for your Halloween web searches. I don't expect many people to be actively searching for these jerseys, but you never know when you can use a funny Halloween costume. Or hockey jersey. In any case, there are certainly some horrible jerseys shown here, and any and all comments will be welcomed below. Until next time, brush your teeth after all that candy, and keep your sticks on the ice! In case you missed it last week, there was a rumour out there that NHL players were forcing Reebok's hand in replacing the "new technology" of the Rbk Edge jerseys with the old flo-knit jerseys due to the new jerseys not breathing and allowing moisture out. Of course, Reebok and the NHL came out and squashed this rumour, mostly because both see major dollar signs in this partnership. However, it remains to be seen how many players will actually switch back to the old fabric instead of the new "wetsuit" that Reebok is marketing hard. Today, thanks to our Music City Correspondant, we have a few up-close looks at the jersey. Sage Confucius sent me these photos a while back, but I needed the right venue and story to present them. Thanks to The Globe And Mail's Eric Duhatschek, he wrote a couple of blog articles about the jersey problems. You can read the first one here, and the follow-up here. First, here's the up-close look at the new jerseys that Reebok has designed. Thanks to Sage, we can clearly see what they look like in terms of detail. The chest area appears to have that woven wicking fabric on it, and I've never been a fan of it. Personally, it's way too stretchy for any sort of hockey jersey, and, for what it's worth, the spandex-esque feeling really bothers me. 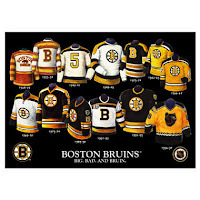 And apparently it bothered some players from the Bruins and Penguins enough in that the sweat made by the players could not evaporate due to Reebok's technology. This was the major flaw that was talked about so long ago when Reebok introduced this new "uniform system", and now it is coming to light. There is no ventilation or cooling in this new technology, and it includes the neck, the side panelling, the sleeves, and the underarm. When Reebok tested these jerseys, they should have been tested in game situations, not a 15-minute practice session with each team. Clearly, there are certain things on the Rbk Edge Uniform System that just aren't working. Not only are they poor in terms of ventilation and cooling, but that have those stupid rounded hems at the bottom of the jersey that I still cannot fathom as an idea of technology. Someone's great idea has already been changed into what looks like a normal hockey jersey. The New York Rangers have decided that the lunacy of these new jerseys can left behind, and they've collectively started to "fix" the rounded hems. Thanks to Joe Duider, reader of the UniWatch blog, he sent me a few photos to help illustrate this point. Nigel Dawes' jersey has been fixed, and can be clearly seen here. The fact that he is a recent call-up from the AHL shows that this fix is being done by the equipment manager on all of the Rangers' jerseys. In fact, Joe's photos show exactly how it is done. Henrik Lundqvist's jersey has been altered in this picture so that the rounded hemline is no longer round. In a closer view, you can see that the hemline has been folded underneath and, most likely, sewn in order for it to stay there. It occurs on all of the Rangers, and can be seen on Michal Rozsival's jersey as well as Dan Girardi's jersey. Perhaps it is time for the NHL to go back to Reebok and ask if Reebok would like a "do over" on some parts of the uniform system. The technology is great, but it is impractical. The rounded hemlines are useless, and teams have already begun to modify their templates for their own good. Use your multi-million dollar R&D department, Reebok. Otherwise, why are you paying them? Finally, thank you to both Sage Confucius and Joe Duider for their photos of the new Rbk Edge Uniform System. I appreciate the hard work, and you guys deserve a huge thanks. A huge thanks to commentor Tim as well. He reminded me that DAN Girardi is the Rangers' defenseman, not Joe. All the talk about Joe coming to New York City got my Girardis crossed in my head. In the very first installment of Teebz's Book Club, I am proud to bring to you Gretzky To Lemieux by Ed Willes. Mr. Willes' story of the 1987 Canada Cup goes beyond the games themselves. Instead of just highlighting what is considered the biggest goal in Hockey Canada's history, Mr. Willes goes about showing the drama and stories-within-the-story about all the politcal manoeuvring done on both the Canadian side and the Russian side. Packed with interviews from both sides, Mr. Willes features comments from some of the game's biggest stars from that period of time: Gretzky, Messier, Coffey, Larionov, Kasatonov, Lemieux, Hawerchuk, and many others. They all tell of the games themselves, but also divulge details into some of the behind-the-scenes drama that never made its way to the public eye. The book itself is divided into seven chronological chapters, along with a prologue, to help rebuild the entire series from training camp to fallout. Mr. Willes has done an excellent job in piecing together the history on both sides of ice, examining all the Canadian problems as well as documenting the situations that arose with the Russian team. Mr. Willes has shown a keen eye for detail, especially in his examination of Alan Eagleson. It is this attention to detail that should encompass any and all hockey fans in that it provides an up-close look at some of the early major struggles that hockey has had to endure. In reading this book, it brought back several memories of watching the Canada Cup Finals on TV. I have seen the highlights over and over, but now I see more than just a drop pass from Gretzky to Lemieux. Mr. Willes has done an excellent job in showing the insight and thinking from some of the greatest minds to have ever been involved in hockey, most notably from the Russian side of the coin. Mr. Willes goes deeper than just the surface story and "the goal" to show exactly how the NHL players began the grassroots movement to what is now the NHLPA. He examines the Russian dream of playing in the NHL, from the thoughts of rebellion to actually lacing up the skates in the NHL. And, of course, Mr. Willes breaks down each of the Canada Cup Final games play-by-play, period-by-period with interviews from the players themselves. I would personally say that this book is worth every penny for any sort of hockey fan, hockey historian, or sports fan. If you would like to read an excerpt from Ed Willes' Gretzky To Lemieux, please click here. Gretzky To Lemieux by Ed Willes gets the Teebz's Book Club Seal of Approval. It will certainly be a book that I refer back to in regards to its vast quantity of information. As an aside, I will have another review shortly as I started reading a second book already. Keep your eyes on this blog for more TBC reviews, and I've created a section on the right where you can read all the reviews. Until next time, read a book and keep your sticks on the ice! 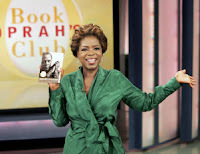 I never thought I'd have a picture of Oprah on this blog, but now I do. Why? For starters, she has always been an advocate of reading, and she does a great job in promoting great authors. Her book reviews are generally pleasant, but her reviewers do a good job in the reviews themselves. Well, I've been given the opportunity to review books as well, so I am proud to say that I am starting "Teebz's Book Club" today in order for you to get an insight on a few good hockey books. And I've already started with a few great books. I'm going to try to have a review ready for the start of each month at this early point in time. I have three books on the go right now, and one is nearly done. That is the first book I will review. The others will be finished as soon as humanly possible, and those reviews will be tentatively set for early November and December. If you know of a hockey fan, these might be invaluable to you as Christmas gift ideas, and I will link back to a site where you can get these books. In all honesty, I am excited to bring this sort of activity to this blog for the people who enjoy reading this site, and for people who enjoy reading as it is. Teebz's Book Club will mainly deal with hockey literature, but I also may branch out into other areas that have hockey-related items included. My first review should be done before Halloween, so check back soon if you want to see what I am reading. I do want to say thank you to a lady by the name of Kate Henderson. Without her, this new endeavour on Hockey Blog In Canada may not have been possible, or even considered. Thank you, Miss Henderson. How The Mighty Have Fallen: If you look down the standings in the NHL today, there are two franchises who posted 100+ point seasons last year that are at the bottom of their respected divisions. Last season's President's Trophy winners in the Barney Rubble Hairpieces have posted a 3-4-0 record in seven games this season, and currently sit ten points behind division-leader Ottawa. It was expected that the Hairpieces wouldn't be as strong as last season after all the departures, but I don't think anyone would have expected Lindy Ruff's team to struggle this much early on. Hopefully they can turn it around because they have a young, exciting team. The other team sitting in the cellar of their division is the Nashville Predators. Nashville is 2-5-0 in seven games thus far, and have only shown brief flashes of the team they were last season. In fact, Chris Mason hasn't been close to his phenomenal record of last season, and the team is hurting for scoring after the departures of Peter Forsberg, Paul Kariya, Scott Hartnell, and Kimmo Timonen. They are nine points back of division-leading Detroit, and trail perennial cellar-dwellers in Columbus, Chicago, and St. Louis. Barry Trotz has to get his team on track, or it will be a long season of empty seats in Music City. Atlantic Flip-Flop: If you look quickly at the Atlantic Division's standings, you might do a double-take. Philadelphia, who finished last season in last place, is leading the division with twelve points. The New York Islanders, who finished fourth in the division, is second with ten points. Pittsburgh, who finished second last season, sits third with eight points. The New Jersey Devils, who won the Atlantic Division last season, sit fourth with seven points. That leaves the New York Rangers, who finished third in the division last season, in last place with five points. The Rangers, who have been struggling thus far this season, were picked by many pundits to win their division, and possibly advance to the Stanley Cup Finals. If Tom Renney can't right the ship in Madison Square Garden, don't be surprised if GM Glen "I'll trade anyone" Sather starts heating up the phone lines. Hank Is On Fire: Your leading point-getter this season is Henrik Zetterberg after three weeks. He sits atop the leaderboard with an astounding 17 points (7G, 10A) in nine games. If Zetterberg can play in all 82 games this season, he's on pace for a 154-point campaign. Now, we all know that streaks come and go, but Hank has been firing on all cylinders so far, and Detroit has rode that streak to a 6-2-1 record. For the 7th-round, 210th overall pick in the 1999 entry draft, Detroit has shown that there is no dollar value on good scouting. Especially when it leads to continual winning. Tonight's Sked: There are some big games in the NHL tonight. I'll run them down quickly with the overview of what each team needs in their respective game. 1) New York Rangers @ Pittsburgh Penguins - Rangers need a win badly, and Pittsburgh looks to continue to build after starting slow. 2) Atlanta Thrashers @ Toronto Maple Leafs - both clubs need a win desperately. Atlanta and Toronto can't afford to fall further behind if they want to make the playoffs. 3) Colorado Avalanche @ Edmonton Oilers - Ryan Smyth returns to Rexall Centre as the Oilers look to beat a divisional rival in their quest for the playoffs. 4) Columbus Blue Jackets @ Chicago Blackhawks - both teams look to build on decent starts as they work towards a playoff spot. Toews and Kane look to continue their run for the Calder Trophy. 5) Anaheim Ducks @ St. Louis Blues - both teams started slowly, and both are looking to make their way up the standings. Kariya faces the Ducks on home ice in St. Louis for the first time. 6) Nashville Predators @ Los Angeles Kings - two struggling teams look to turn their seasons around with a win tonight. Mike Cammalleri shares the goal-scoring lead with eight goals. Nashville must shut down Cammalleri and Kopitar. That's all for today. I should have my first review up in the next couple of days. Have We Not Gone Over This? Dale Purinton, pictured as a New York Ranger to the left, has now been given a twenty-five game suspension by the AHL for his actions during the October 17, 2007 game versus the Iowa Stars. The defenseman for the Lake Erie Monsters was assessed a match penalty at the 20:00 mark of the second period of the game under AHL Rule 47.14 for punching an unsuspecting opponent and causing injury. Purinton was thrown out of the game for punching Iowa Stars' forward Marius Holtet in the back of the head during a skirmish at the end of the period. Hotlet suffered a concussion as a result of the punch. "An incident such as this has no place in our game," said AHL President and CEO David Andrews. "Mr. Purinton struck Marius Holtet in the head from behind with a gloved fist after the completion of play. This was a dangerous and deliberate action, by a player who is a repeat offender." As pictured above, Purinton was suspended for the first 10 games of the season by the NHL in 2005 for the eye gouge he put on Colton Orr of the Bruins. In 2004-05, he was suspended by the ECHL for refusing to stop fighting and pulling the hair of an opponent. He was suspended three NHL games in 2002 for sucker-punching Jason Blake of the Islanders. He was suspended seven NHL games in October of 2001 for crosschecking Washington's Stephen Peat across the head, and four NHL games in September of 2001 for beating up goaltender Garth Snow in a pre-season game. Dale Purinton is the lowest of the low when it comes to "enforcers". The guy is a complete goon, and should be banned from the game. He has little hockey skill, and even less brains to go along with that marginal talent. His repeated offenses have taught him nothing, as shown, and he continues to risk players' lives with cheap shots and headshots. Can we not remove these types of players who clearly don't understand that headshots are not allowed? Even if we were on the "Three Strikes - You're Out" idea, he would have been banned for his completely reprehensible play already. I'm sorry, but the management of the Colorado Avalanche need to release this "player" (I use that term loosely) before he injures someone again. If I were the Dallas Stars, I'd be furious. Holtet, 23, had one goal in five games this season, and was selected 42nd overall by the Dallas Stars in the 2002 NHL entry draft. He holds the distinction of the highest-drafted Norwegian in NHL history, and the Stars must have seen some talent to draft him that high. Now, he's forced to watch as he clears the cobwebs from Dale Purinton's stupidity. I have never said this before, but Dale Purinton should be banned from hockey altogether. He has the history of committing acts that may result in injury, he's shown a propensity to recommit these offenses, and has injured people seriously in the process. Someone needs to reach down and have the cajones to make Purinton the example. Otherwise, when Purinton returns on December 29, we could be re-opening this entire discussion about Purinton's complete stupidity. It was fifty years ago today that Maurice "The Rocket" Richard set the goal-scoring benchmark for great players and future Hall of Famers. On October 19, 1957, "The Rocket" took a pass from linemate Jean Beliveau and scored a powerplay goal at 15:52 of the first period that drew a standing ovation from the 14000-plus people at the Montreal Forum. Richard had just scored his 500th NHL goal in his storied career at 36 years of age. The Montreal Canadiens would go on to win the game over the Chicago Blackhawks by a score of 3-1, and Richard's benchmark would be the mark that all other players would measure themselves against. "The great crowd of 14,000 and change at the Montreal Forum went nuts," longtime Montreal Gazette reporter, Red Fisher, recalled. "When the goal was announced, the ovation for him was a little over two minutes and probably would have continued if the officials hadn’t got the teams together and restarted the play." Richard retired from the game after the 1959-60 campaign with 544 goals to his name. In 1944-45, he set the 50-goals-in-50-games record that a few have since broken. "The Rocket" scored his first goal in 1942, and helped the Canadiens win eight Stanley Cups over the course of his career, including five consecutive Stanley Cups from 1956 to 1960. 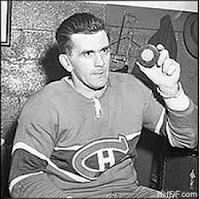 Maurice Richard, unfortunately, passed away after a lengthy battle with cancer on May 27, 2000. The Montreal Canadiens are planning a scoreboard tribute to "The Rocket" before their game against the visiting Barney Rubble Hairpieces this Saturday in honour of Mr. Richard's achievement. "I remember that getting to 500 was pretty special," Wayne Gretzky told NHL.com. "Growing up as a kid, you see Maurice Richard got 500 and Gordie Howe got 500 and that was sort of the benchmark." Gordie Howe became the second player with 500 goals on March 14, 1963. Longtime Chicago Blackhawk and Winnipeg Jet Bobby Hull achieved the mark on Feb. 21, 1970 to become the third player. Richard's linemate on his historic night, Jean Beliveau, accomplished the 500-goal feat on Feb. 11, 1971. Frank Mahovlich of the Montreal Canadiens was the fifth player to hit that mark, doing so on March 21, 1973. - three players scored goal #500 into empty nets: Mike Bossy, Wayne Gretzky and Jari Kurri. - seven players got their 500th goal to complete hat-tricks: Jean Beliveau, Wayne Gretzky, Mario Lemieux, Mark Messier, Brett Hull, Jaromir Jagr, and Mats Sundin. - Hall of Fame goaltender Patrick Roy allowed three 500th goals: Steve Yzerman, Joe Mullen, and Brendan Shanahan. - 13 were scored on the powerplay. - two were short-handed: Gordie Howe and Mats Sundin. - Mats Sundin's 500th goal was the only one scored in overtime. - 26 of the 39 players scored their 500th goals on home ice. - Joe Sakic of the Colorado Avalanche scored his 500th goal in his hometown of Vancouver, British Columbia. - 14 players scored all 500 with the same franchise. They include Maurice Richard, Gordie Howe, Bobby Hull, Jean Beliveau, Stan Makita, Guy Lafleur, Mike Bossy, Gilbert Perreault, Wayne Gretzky, Bryan Trottier, Mario Lemieux, Steve Yzerman, Joe Sakic, and Mike Modano. - Joe Mullen and Mike Modano are the only two Americans to have scored 500 goals in their careers thus far. Jeremy Roenick of the San Jose Sharks has 497 thus far, and Keith Tkachuk has 476. Rest in peace, Monsieur Richard. Your benchmark will live on forever as players strive to equal or better it. Roenick is next, barring any sort of injury, so be prepared, San Jose. He'll let you know about it when he hits it. The situation in Atlanta is almost critical. The Atlanta Thrashers failed to show up on the road again last night, losing 4-0 to the Philadelphia Flyers for their sixth loss in a row this season. I can't even suggest what the Thrashers can do since all of their top players were in the lineup last night. In terms of being bad, consider this: the Thrashers' veteran star players of Bobby Holik, Vyacheslav Kozlov, and Marian Hossa were a combined -9 last night, with Holik leading the way at -4. He was on the ice for every goal the Flyers scored. Thanks to the lacklustre play, Hartley is gone. Bob Hartley was relieved of his coaching duties today by general manager Don Waddell, with Waddell taking over in the interim. I said it on Monday that his days were numbered. I guess that number was six games. Good luck in finiding a quality replacement, Mr. Waddell. You're going to need it. Your team has yet to show up, and could be mistaken for an ECHL team most nights. I wish you luck in finding someone who can help get this franchise out of their current funk. The Strong Get Stronger: The signing of Randy Robitaille by the Ottawa Senators may not seem like a blockbuster, but I think it will help Ottawa immensely. Robitaille is a good "hustle" guy, can play on the powerplay, and will be an effective third- or fourth-line scoring threat for the Senators. In 463 NHL games, Robitaille has scored 74 goals and 153 assists for nine different teams. He'll need to be a little more defensively-responsible to fit into the Senators' system, but he'll provide that extra hustle that the Senators seemed to miss late in the season last year. Good signing, Mr. Murray. It should help your team out. The Streak Is Over: I made mention last time about the strong start that the Wild got off to with five straight wins. I figured a sixth was pretty much in the bag going up against the 1-and-5 Los Angeles Kings, but the Kings ended the winning streak by handing the Wild a 4-3 shootout loss. Anze Kopitar scored a highlight reel goal to force the shootout, and showed why he is one of the most dynamic players in the NHL right now. Jean-Sebastien Aubin recorded his first win with a 28-save performance. Good job, Kings. Now it's time to string a few wins together. In a row. Who Is This "Josie" Guy? : Jose Theodore, he who has been linked to Paris Hilton and a chorus of boos in Colorado, played the hero for the Colorado Avalanche last night in the 5-4 shootout win over the division-rival Calgary Flames. After the Flames put up four goals on starter Peter Budaj, Theodore came in and stopped 17 shots to help the Avalanche to the victory. "When you get in, it's never easy, you're not as warmed up," said the humble Theodore. "I was trying to keep it simple, give my team a chance to win, and they showed a lot of character coming back." For a guy who was rotting on the bench last year, he looked solid last night. He still has the tendancy to wander, but if coach Joel Quenneville has Theodore's head screwed on right, the Avalanche might be back to contender status this season. The former NHL MVP might still be the "1A" goalie, but he should be a solid choice if Budaj falters. Only time will tell, but one game and one win is a good confidence builder. That's all for today as I'm swamped with work. Have a good one, and I'll be back soon. Hello, and salutations on this Monday. It was a great weekend, and Monday morning, for hockey. CBC carried an excellent game of defensive mistakes and miscues between the Penguins and Maple Leafs. They folllowed it up with the Oilers losing to the Canucks yet again. Montreal's home opener was ruined by the impressive Hurricanes, and the Senators kept rolling along after defeating the Rangers. The games weren't the only things to be noticed, though. Jesse Boulerice was put on waivers this morning, marking the end to his NHL season most likely. However, I'll focus on a few of these things below. Shinny Night In Canada: I have to hand it to the Maple Leafs for playing some of the most dreadful hockey seen so far this season. Not only do they lose to the Penguins 6-4 after leading 3-1 part-way through the second period, but they get outshot at home 52-27. How is it that a team, playing at home, can be outshot almost 2-to-1? Does anyone in the Maple Leafs' dressing room care about this season besides Tucker, Sundin, and Blake? If I am Paul Maurice, I am preparing my resumé as you read this. If he can't motivate his team to be better than what it has shown so far this season, he'll be the dreaded "First Man Out". Most of the hockey game looked like a weekend pickup game on a local backyard rink. Poor passes by both teams, lots of giveaways, and far too many missed assignments. The Penguins played far too fancy, trying to make one more pass than necessary most of the night. The Leafs, on the other hand, seemed to think that this was some sort of training camp practice. The physicality was missing, the uptempo skating was not there, and the defence looked mesmerized by the skating Penguins. If I'm a Leafs fan, I am begging for Raycroft to be put back in. Vesa Toskala, in four games, has allowed 18 goals-against for a whopping 4.48 GAA while posting one win versus three losses. His save percentage of .878 was only helped by the amount of rubber he saw in the Pittsburgh game, but those stats are atrocious. Playoffs, Leaf fans? Keep dreaming if your goaltending and defence continue to play the way they are. Minnesota Machine: The Wild have jumped out to a 5-0-0 record thus far this season, and remain the only undefeated team in the league. This can be accounted to defence and goaltending. Niklas Backstrom has backstopped four of the five wins so far, and has only allowed four goals. His two shutouts, .959 save percentage, and 1.00 GAA lead the league in those respective categories. His partner in between the pipes, Josh Harding, stopped 37 shots from the Kings for his first win and shutout of the season. Yes, they play trap, so it can be boring hockey, but with the Wild's best start in franchise history so far, they may be pushing for that top spot in the Northwest Division. Vancouver, Colorado, Edmonton, and Calgary had better pick up the slack if they want to keep pace with the Wild or this race will be over before it started at this rate. First To Worst: Think Bob Hartley is feeling the heat? How does a team go from posting a 43-28-11 record and being first in the Southeast to being 0-5-0 with no points and only nine goals to show for the effort in the first five games? I understand teams get off to slow starts, but no one in the NHL has scored less than the Thrashers, and only Toronto and Los Angeles have given up more goals. The difference is that Toronto has played seven games, and Los Angeles has played six. If Atlanta's franchise is truly on the market for a buyer, bid low. This team has all the makings of a franchise ready to collapse on itself. When Ilya Kovalchuk resorts to throwing punches and no one steps in to help, there are serious problems on this hockey team. Take a look in the mirror, Hartley. They start with your leadership. Phantoms Get A Goon: Jesse Boulerice was waived by the Philadelphia Flyers today, possibly ending his NHL season this year. His 25-game suspension will be reviewed by the AHL, but he is still responsible for 25 NHL games. Much like Steve Downie's suspension, it is thought that the Flyers could bring him up for a few games at a time to sit in the press box. Honestly, though, why would you? Let him rot out his one-year contract with the Phantoms, and then be done with him. Why waste a roster spot? As for the rest of the NHL, teach this guy a lesson and don't sign him when he's done with the Flyers. No respect for your fellow players means no contract for next season. Welcome "Q" Back: In what could be called a merciful move by the Los Angeles Kings, highly-touted goaltending prospect Jonathan Bernier is being sent back to Lewiston of the QMJHL. According to his TSN page, Bernier was on pace to record a season of 14-41-0 in 55 appearances. His 4.03 GAA and .864 save percentage wouldn't get Calder or Vezina consideration either, so off he goes back to Lewiston. Honestly, this is the best move for Bernier. As spectacular as he was in England against the Ducks, he has suffered being back on North American soil. I think he'll be a decent goaltender in the future for Los Angeles, but this was really the only move that Dean Lombardi could make in order to save the kid's confidence from being shattered. I look forward to seeing Bernier play well in the "Q", and look forward to possibly seeing him in the World Junior Championships for Canada this season. Back From Binghampton: Ray Emery returned to Ottawa after a two-game conditioning assignment with the Baby Sens. He stopped 34 of 38 shots in a 4-1 loss to the Syracuse Crunch, but responded on Saturday by stopping 46 shots in a 5-2 victory over the Hershey Bears. With Martin Gerber playing as well as he had, I would guess that coach John Paddock would ride the hot goalie. However, knowing Emery's competitve nature, he may get the start in Ottawa's next game on Thursday versus Montreal. Paddock says he hasn't given any thought as to who will start. I'm sure there's more I could write about, but that's all for today. Any thoughts, comments, complaints, and/or questions can be left on the comment section below. 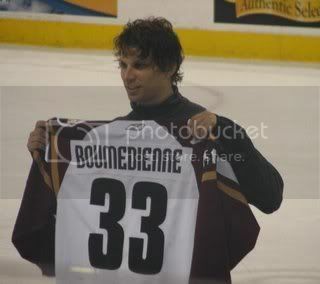 Jesse Boulerice will be joining Steve Downie on the shelf for quite sometime. Colin Campbell followed precedent in handing Boulerice a twenty-five game suspension, much in the same fashion he gave Chris Simon twenty-five games to think about using a stick on someone's head. I applaud Mr. Campbell's decision regarding this situation, and encourage him to do more to end headshots. And that brings me to the hit in Nashville delivered by Jordin Tootoo to the head of Daniel Winnik. This is the kind of hit that could have ended much worse. Personally, I think Jordin Tootoo should be parked for twenty games as well. However, I'll let watch the video below before I expand on this. And listen to the announcers. They'll give you an idea of exactly what happened. I find it hard to believe that Jordin Tootoo didn't receive a penalty, let alone a suspension, for this hit. The NHL has said that the hit was legal as Winnik had the puck and should have had his head up. Granted, that is true, but let's look at what Tootoo did to make this situation far uglier. Start with the six strides he takes in his approach to hit Winnik. Much like Downie's hit, he increased his speed in order to make the hit more violent. Physics says that if you're moving faster, the resulting collision will be far greater. In this case, it was. The next problem was that Tootoo wasn't even covering anyone. His man is the defenseman on the lower portion of the video. He watches the play develop, and then skates in from the top of the faceoff circle. Again, he speeds up as he cruises in. That's over twenty feet of room from where Tootoo left to where he nailed Winnik. Anyone here care to say that this wasn't pre-meditated? He lined up Winnik from the moment he saw Winnik leave the opposite corner. How many more of these vicious hits do we need to see? Thankfully Winnik wasn't hurt on the play, but it's not like Tootoo isn't a repeat offender when it comes to vicious shots to the head. Remember Stephane Robidas? Stephane Robidas didn't even have his hands up, and he was sucker-punched by Tootoo. The hit that Tootoo threw on Modano was legal, and all Robidas was coming over to do was to let Tootoo know that hitting a star like that wouldn't be tolerated. Instead, all Robidas saw was stars. I get the fact that Tootoo is a "Charlie Hustle" guy for the Predators. I know he's supposed to go out there and energize the team with a big hit. He's a scrappy player who does whatever he can to get under the skin of other players, and the Predators need a guy like that. What the game of hockey doesn't need is a head-hunter. 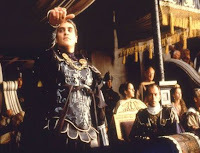 With that in mind, Jordin Tootoo should be sat down for his blatent and obviously pre-meditated hit in "Death Valley". Colin Campbell has already ruled that the hit was legal according to the rules, but sometimes what is legal is not always right. That's why we append laws and change rules in society. We do it so that there aren't injustices when circumstances change. The NHL needs to evolve as well. Removing these kinds of vicious hits will only serve the game better. In looking at the violence of these types of hits, E from A Theory Of Ice presents an excellent argument. It's a long read, but well worth it. Hockey isn't just some video game on TV. Real people are playing this game, and these types of hits only serve to ruin the image and integrity of the game of hockey. If the NFL and CFL can ban hits the heads, why can't the NHL? I leave you with that question to ponder. Keep the ball rolling, Colin Campbell. Suspend everyone until headshots are gone. No sooner do we get past one headshot in the NHL, someone has to go and do something stupid again. To make matters worse, the incident occurred at the hands of a Philadelphia Flyer again. I've gone over, in great detail, why Steve Downie's hit on Dean McAmmond was a blatent attempt to injure, so I will not get into that debate again. Downie admitted he did wrong, and he will serve his suspension without any objection. Jesse Boulerice, pictured as a Hurricane to the left, will certainly have some time on his hands after his brutal crosscheck to Ryan Kesler's head in last night's game versus Vancouver. Boulerice is known throughout the league as an enforcer, a guy who would rather throw fists than score goals. In 167 NHL games, Boulerice has totalled a whopping eight goals and two assists while piling up 319 PIMs. Let's face it: the guy is a goon. In the OHL as a junior, Boulerice never finished below 150 PIMs. His best season in the OHL came as a Plymouth Whaler when he scored 20 goals and 23 assists for 43 points in 53 games while sitting in the sin bin for 170 minutes. The year before that, he scored 10 goals and 14 assists in 33 games for the Detroit Whalers while spending 209 minutes in the penalty box. You read that correctly: the guy played 20 less games and had 40 more PIMs. In fact, during the 1997-98 season, while as a member of the OHL's Plymouth Whalers, Jesse Boulerice swung his stick like a baseball bat and caved in the face of the Guelph Storm's Andrew Long. Boulerice was suspended for the entire next season, his overage season, in the OHL, and pleaded no contest to aggravated assault. Boulerice's development as an NHL goon hasn't changed much. He led the Flyers in the pre-season this year with 47 PIMs, and already has 15 PIMs in the two games he's played thus far. Last night, while the Flyers led 7-2 in the third period, Ryan Kesler attempted to throw a big hit on Flyers defenseman Randy Jones, but only connected partially. Jones barely even looked affected by the attempt. As a means of retaliation, Boulerice attempted to hit Kesler, but instead crosschecked him across the face, breaking Boulerice's stick. "I wanted to give him a hit back," said Boulerice, knowing that he is now at the mercy of the NHL's disciplinarian, Colin Campbell. "He cross-checked me right in the jaw," said Kesler, through a swollen lip and swollen right jaw. "Obviously, it's a dirty play. You don't like to see that happen to anybody. To have it happen to yourself, obviously, you're pissed off about it, and you shouldn't be in the game. "I'm just lucky that my jaw's not broken. Hopefully, it's not fractured and we'll go from there." Flyers head coach, John Stevens, offered his perspective of the play. "It's unacceptable and it's something we can't have," he said of Boulerice's infraction. "The whole idea is we were telling those guys to just go out and play and let's keep rolling our lines and get the forecheck going. "We need to be extremely disciplined and we didn't need to get involved with anything really - we had the hockey game in hand. And that was the message on the bench." From this writer's perspective, this should be another twenty game suspension, if not more. Headshots are going to get someone killed, and they need to be stopped now. Boulerice's crosscheck was deliberate, and he should be forced to sit for twenty, even thirty, games. If Steve Downie was the benchmark for eliminating hits to the head, Boulerice's suspension should set a new standard. A crosscheck is a deliberate hit to the head no matter how you see it. If Chris Simon can receive a 25-game suspension for using his stick on the head of Ryan Hollweg, Jesse Boulerice can receive the same. The precedent has been set. Now it's up to Colin Campbell to have the nerve to send the NHLPA a message: headshots are unacceptable, and will be punished with extreme prejudice. Anything less than twenty games, and Colin Campbell will lose the war against headshots. If he loses this war, the NHL will be dealing with this headache for a long, long time. Until next time, and I mean this seriously, keep your sticks on the ice! 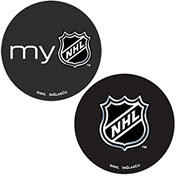 In the NHL's battle to attract corporate sponsorship, they've hooked up with some pretty reputable companies to put money in their coffers - Reebok, Mastercard, Mission, and a variety of other sponsors. However, one of the NHL's biggest sponsors is pulling the plug on its hockey venture. Nike has decided that "it was putting on the block its flagging hockey division, known as NikeBauer". In an era when hockey is supposed to be thriving, according to Gary Bettman, losing one of the biggest corporate entities on the planet cannot be good. 1) "By 1993-94, some 303,000 amateur players were registered with USA Hockey, the sport's governing body in the U.S., up 55 per cent from 1990-91. The sport had generated such a buzz that media company Walt Disney was even investing in hockey overseas, buying a stake in Russia's famed Central Army team. "USA Hockey figures show that in 2005-06, the most recent year for which statistics are available, there were 442,077 registered players in the U.S., down from 445,245 in 2004-05 – the second-straight year of decline." Yes, falling numbers in grassroots hockey is a problem. I'm no marketing wizard here, but why wouldn't the billion-dollar company known as Nike get onboard with USA Hockey and help promote the game, and grow it at the grassroots level? Seems elementary to me, Phil Knight. Grow the game, grow your business. 2) "After buying Canstar, Nike decided to allow the Canadian company to operate independently. While Canstar factories churned out Bauer and Cooper branded skates, facilities in the U.S. and overseas produced a separate Nike line. "Retailers were returning an inordinate number of skates to Nike because they didn't fit comfortably. The company's top NHL endorsement agent, Detroit Red Wings high-octane star forward Sergei Fedorov, reportedly cut ties with Nike over similar concerns. "Nike subsequently merged the two hockey divisions. Last year, it combined all of its hockey offerings under the NikeBauer brand." I'm almost certain that having your most-marketable stars cutting ties with your business will result in lost sales. Hockey skates aren't basketball shoes. It can take weeks to have the skate fit properly when breaking it in. Hockey skates are an extension of the foot, meaning that if they are uncomfortable, one's game will suffer. Nike should know this from all its worldly knowledge on shoes, especially when it comes to sprinters and runners. It appears that Nike was more concerned with dollars and cents than common sense. "'It really went south,' said Jim Rennie, who published Jim Rennie's Sports Letter, a widely read sporting goods newsletter, from 1977 to 2002. "Skateboarding came on in popularity and they just marketed in-line skating wrong," Rennie said. "They were too focused on the extreme rollerblader who was doing jumps and everything, not the average skater.'" Not only does Nike not make good skates, they can't even market to the correct demographic they need. The X-Games crowd is hip and cool and all that, but the average in-line skater doesn't care about which bearings will allow for better railslides. In-line skating is still popular, but the marketing has to be done correctly. Marketing in-line skates to 10% of the general population is a great way to lose sales. 4) Firenzo Arcadi, who owns Toronto sporting goods store Toronto Hockey Repair Ltd., has another theory about why the hockey business has swooned. "'It's the $900 skate,' Arcadi said, referring to NikeBauer's latest offering, a sleek silver, black and blue skate called the Supreme one90 that retails at some stores for $899. "'These companies like Nike are pricing themselves right out of the market,' said Arcadi, whose store sells about $2.5 million worth of equipment each year, down from $3 million just four years ago. "'It's at a point where families are having to decide whether they want to pay a $1,100 mortgage or buy skates,' he said." Take heed, Reebok. 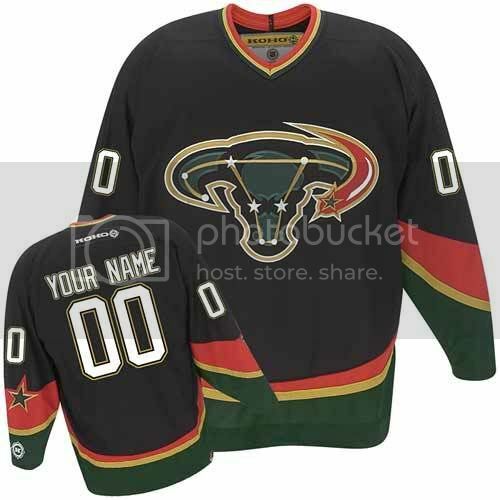 You've already raised NHL jersey prices, and you now have the majority of the market in terms of merchandise sales. Over-pricing your merchandise is the best way for your sales to dry up. Nike charged ridiculous prices on hockey equipment and merchandise, and now they're out. You've been warned, Reebok. Nike lasted 14 years in hockey. You could be looking at less. Looking at Mr. Westhead's article, he has identified the major problem with the growth of hockey in North America: skyrocketing prices. The average fan can barely afford a T-shirt today instead of an NHL jersey. Corporate America, specifically Reebok, should look at making the NHL affordable for everyone before just lobbying to their corporate friends and CEOs with six-figure salaries. At this rate, those are the only people who can afford to be fans. With Nike out of the picture in terms of competition, Reebok has a definite advantage in making a difference in the game of hockey. Will they do it? It's all up to Reebok. Mr. Westhead, you've written a wonderful article, and I commend you for your work. Hello! It's Monday, and I survived the weekend. It's too bad the Ducks didn't. What has happened to the Anaheim Ducks? The defending Stanley Cup Champions are having a myriad of problems in keeping the puck out of the net, and none of it has to do with Dustin Penner being gone. Ilya Bryzgalov has looked nothing like himself from last season, and youngster Jonas Hiller didn't fare very well against the Penguins. Is Jean-Sebastien Giguere the only player who can save the Ducks now? Jonas Hiller has Anaheim's only win thus far this season, but is sporting a 3.03 GAA and an .885 save percentage. Anaheim won't get very far with those numbers unless coach Randy Carlyle can tighten up the defensive end of his system significantly. The man who is supposed to be the starter, Ilya Bryzgalov, is 0-2-1 this season, and has a 2.95 GAA and a save percentage of .909. Anaheim has been anything but the dominant team they were last season. I would guess that with Scott Neidermayer and Teemu Selanne not filing their retirement papers as of yet that Brian Burke will be on the phone soon if this losing trend continues in California. Anaheim's breakout has been non-existant, and both Neidermayer and Selanne can help there. It would also help if Mathieu Schneider could return to play from injury. As of right now, though, the Ducks have been lacklustre in most facets of their game. The Opposite End: The defending Eastern Conference Champion Ottawa Senators continue to roll early on in this NHL season, going to 4-0 with their 4-2 victory over the New Jersey Devils this afternoon. Martin Gerber has been solid, and the "big three" of Alfredsson, Heatley, and Spezza have been clicking on all cylinders so far. Ottawa is the odds-on favourite to win the Eastern Conference by most pundits, and they've not let anyone down so far. They have a big, mobile, tough defensive unit, and their fast, skilled forwards capitalize on mistakes. The Ottawa Senators look hungry thus far, and they might be the beast of the East as this season progresses. Health Issues: Word out of Toronto today is a sombre one with the announcement that Jason Blake has Chronic Myelogenous Leukemia, a rare form of the disease. It is an uncommon type of cancer of the blood cells, but it is "highly-treatable", according to Blake himself. "'This morning I shared with my teammates news that I was diagnosed with Chronic Myelogenous Leukemia,' Blake said on the Maple Leafs' website. "'It is highly-treatable, and I have begun taking a pill on a daily basis that has proven to be very effective in controlling this cancer. The prognosis, and certainly the expectations of my physician, myself and my family, is that I will live a long, full and normal life. This situation will not impact my ability to live my life as I otherwise would, and will not affect my ability to perform at my highest level for the Toronto Maple Leafs. I'm looking forward to my first season with the Leafs and helping our club compete for the Stanley Cup.'" This is terrible news for the Blakes as Jason's wife, Lauren, was diagnosed with thyroid cancer in 2001. She had a portion of her thyroid removed, and it was determined that the lump was not cancerous. I wish Jason Blake and his family all the best, and my wishes and hopes go out to him in that he defeats this disease as soon as possible. Call Him "Peter": Congratulations go out to Paul Stastny who is showing that he has the sophomore jump rather than the slump. After finishing second to Evgeni Malkin last season in the Calder Trophy voting for Rookie of the Year, Stastny has recorded eight points in three games. In fact, it's only two games since he was kept off the scoresheet against Nashville. Stastny recorded a hat trick on opening night against Dallas, and the had a five point performace (1G, 4A) against the San Jose Sharks, including scoring the game-winner. He is tied for league-lead in goals, and leads the league in points so far. In fact, Dear Lord Stanley has figured out that Paul Stastny is on pace for a 219 point season. Hockey is part of the genetic code of the Stastny family. Thanks for bearing with me while I went through the birthday and Canadian Thanksgiving weekend. I'll be writing more often now. Until next time, keep your sticks on the ice! Greetings, faithful readers! I hope you've been enjoying the action in the NHL so far. I was intrigued by the Philadelphia Flyers-Calgary Flames tilt last night, and have thoroughly enjoyed watching the Leaf-Nation struggle to come to terms with the fact that their team is still one-line deep, has a swiss cheese-like defense, and somewhat-below-average goaltending. For all the ideas to increase scoring in the NHL, it appears that everything has gone the wayside as well. Nine games have been decided by one goal, and there has only been one team to score five goals thus far this season: the New York Rangers. However, a pile more teams have their first regular season games tonight, so hockey will be back in full-swing once Saturday night arrives. This weekend, however, will be spent with me celebrating the old birthday. Today was the day I was born, and I am happy to say that I've made it this far. In doing some research for today, I found out a few things. October 5 is the most-popular birthday in the world. There are more people that celebrate a birthday today than any other day on the calendar. This might be due to the fact that the conception date for a baby born today would be New Year's Eve, but I'll leave that one up to speculation. 2004 - Tiger Woods marries Elin Nordegren. 1982 - New Jersey Devils play their first game. The Devils and Pittsburgh Penguins battle to a 3-3 tie. 1970 - PBS becomes a network. 1963 - 17th NHL All-Star Game is played. The Toronto Maple Leafs and the NHL All-Stars play to a 3-3 tie in Toronto. 1962 - The Beatles release their first album "Love Me Do". 1957 - 11th NHL All-Star Game is played. The NHL All-Stars defeat the Montreal Canadiens in Montreal 5-3. 1952 - 6th NHL All-Star Game is played. The First-Team All-Stars and Second-Team All-Stars play to a 1-1 tie in Detroit. 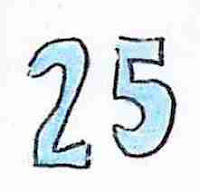 As a sidenote, thank you to everyone who has stopped by and read this blog since early January of 2007. Without you guys, this wouldn't be as fun or as rewarding as it is. I really appreciate all the comments, and encourage you all to check out each and every blog to the right as those people do amazing work as well. Thank you, readers, and I look forward to writing as much as a I can after this birthday weekend is over! I'm starting to get a little angry at the "experts" who seem to think that headshots in the NHL won't stop now that Steve Downie has been forced to sit for twenty NHL games. I appreciate all the comments on the last two entries from everyone, and I am glad that it has brought about an intelligent discussion in regards to this problem in the NHL. However, I still think the NHL should look at this far more seriously than just handing out twenty games to a player who will now be playing for the AHL's Philadelphia Phantoms. If the NHL and AHL are really in a partnership for the development of players, these twenty games should be enforced by both the NHL and AHL as a way to help Downie's development. Let me explain that last statement. If the Flyers want Downie to be an effective player in the NHL, he cannot be sitting on the sidelines with a suspension. His development over those twenty games will greatly fuel his desire to play. The AHL would be wise in keeping his on the sideline for that time in order for Downie to learn that a player needs to be on the ice to be effective. Right now, he's useless to the Flyers, and that's why he was demoted. He's also useless to the Phantoms, but that's ok. He's going to hone his craft in the AHL until the Flyers deem him ready. The management and coaches of both the Flyers and Phantoms should be working with Downie to break him out of this "bad boy" image he has had since his days in the OHL. The hit on McAmmond can be considered an aberration if Downie comes back and works hard at not being a goon with his hits. The NHLPA should also be a part of this as they need to protect their own from their own. Steve Downie can be a contributor to the Flyers, but he has to be on the ice AND using his head at the same time. After listening to Damian Cox on TSN last night as he played the role of Devil's Advocate on the show That's Hockey, Mr. Cox said that Downie's suspension will do little to deter other players from committing headshots. He went through all the same rhetoric as everyone else, saying Downie was an easy target and he broke all the rules when going for this hit, making the decision for the NHL to suspend Downie an easy one. "Targeting or stalking a player? Check. Causing injury and/or intent to injure? Check." If these are going to be the criteria for which suspensions are handed out, expect a lot of players to get suspended. If the hit is a headshot, though, twenty games should be the minimum with no questions asked. Precedent has been set. The NHL needs to follow up on it with the same justice that it handed down to Downie. If they don't, this entire suspension was a lesson in NHL futility. NHL Openers: Tomorrow is a big TV night for me. The Canadiens play the Hurricanes on RDS, the French TSN, at 7pm ET. The Senators play the Maple Leafs in the "Battle of Ontario" at 7pm ET on TSN. I don't get Versus, but they have a double-header going on with the Ducks and Red Wings at 7pm ET followed by the Stars and Avalanche at 9:30pm ET. I'll probably be tuning into the streaming audio feed found on NHL.com for the late game. 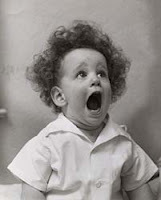 Hockey starts on Wednesday for real! I can't wait! Important Dates: There are a few NHL dates you should be aware of this season, mostly because they have significance to the game. November 10 - Hockey Hall of Fame Game (NYR vs. TML). January 1 - NHL Outdoor Game from Buffalo, NY (PIT vs. BUF). January 27 - NHL All-Star Game from Atlanta. February 9 - Hockey Day In Canada on CBC. February 26 - NHL Trade Deadline Day. April 9 - NHL Stanley Cup Playoffs begin. June 9 - last possible day of the Stanley Cup Finals. As a sidenote, the Toronto Maple Leafs will be mathematically-eliminated from the playoffs some time in November. They haven't picked a precise day yet, but rumours are abound that Mats Sundin is shooting for Remembrance Day in Canada. I'm kidding, Leafs fans! It's just a joke! Unimportant Stuff: Compared to hockey, this isn't that important, but I might not be around much this week. As usual, hockey season coincides with my birthday and the Canadian Thanksgiving weekend, so things are busy in this writer's life this week. However, I will be posting as much as I can, even if it's through a drunken haze due to birthday drinks. Man, I love the start of hockey. It's the best time of the year.